A well known verse - author unknown. I can remember reading the above mnemonic in our Mother Goose Book of Nursery Rhymes. I was also required to write it out, several grades in a row, on lined paper. (Remember the kind with two solid lines separated by a dotted line to guide the writer as to how tall to make upper and lower case letters?) This exercise was to help my classmates and I memorize the number of days in each month. Do kids still learn this poem? I wonder - is this rhyme even still taught in grade school? Or is computer access so readily available for us all, that there is no longer any reason to remember this information? Perhaps, rather than crowd children's minds with unnecessary facts, teachers have decided this poem is no longer unimportant, as they can just as easily use the Internet to look it up? For me, this poem has been useful, but in a limited sort of way. Because of the first line (and probably because I remember learning this at the beginning of the school year), I can always remember that September has just thirty days. I have no trouble remembering the 28 and sometimes 29 days of February. But my brain can easily confuse May for June, because they both have the same number of syllables. Same thing with November and December (October doesn't sound right there though). This confusion taints the validity of my use of this poem! Good thing I learned another trick! Fortunately, during a school recess, a friend taught me a different mnemonic method of counting months on my fist. I am not sure of the origin, but I have been told it dates back to Roman times. Make a fist, and hold your hand with the knuckles facing upwards. Use your index finger of the other hand to assign each of your knuckles and the indented areas between them with a month. Recite the months in order, beginning with January on the first knuckle, February on the indent, etc. The knuckle of your pinkie finger is therefore July. Start over, naming the first knuckle as August. Any month that lands on a knuckle has 31 days; all the indents have less. I will never get a job as a modeling my chapped hands — but you get the idea! Continue naming the months, starting over with knuckles on the same hand. Do you think you might have trouble remembering this? I could easily forget whether it is the knuckles or the indents that represent months with 31 days ... but knowing February is a short month solves this confusion. I look at where February lands — an indent. That tells me that all the shorter months (28/29 and 30 days) are indents - and all the longest months (31 days) are knuckles. So - if you ever see me counting on my knuckles, I am probably just trying to figure out how many days are in a month. This can actually be helpful when there is neither a calendar nor the Internet nearby! Today is September 30 - and my fist tells me it is therefore the last day of September! Did you already know these memory aids? Do you have favorite memory tricks that you use? 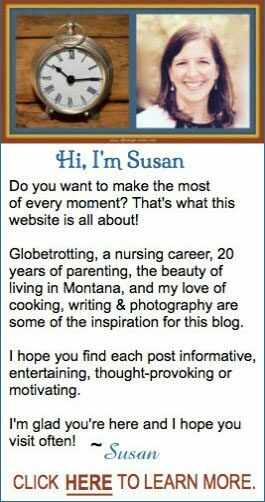 Regular readers of this blog have probably gathered by now that I am quite fond of Montana, the state in which I live. There is a lot I love about Montana - but not the high incidence of suicide here. Montana ranks as one of the states with the highest per capita suicide rates in the US. Often, but not always, victims of suicide have suffered from depression or other mental illnesses. It is time we find a way to reduce the stigma related to these conditions, and lower the incidence of suicide. The “be tough and shake it off” mentality which generations of Montanans have applied in so many circumstances just doesn't work in these instances. It is like telling someone with cancer to ignore it and it will go away. Fortunately, work is being done to increase awareness, and provide resources and treatments for people with mental illnesses and suicidal tendencies. Our team of walkers - just a fraction of the supporters that turned out for the Montana 2014 NAMIWalk. My thoughts were also with a family I know quite well, whose high school-aged son committed suicide last year. It is absolutely heartbreaking to attend the funeral of a person so young. Even in their grief, the parents of this boy recognized the problem of youth suicide, and encouraged the young people in attendance to seek help if it was ever needed. Yesterday was overcast and chilly, with a high probability of rain; sprinkles began to fall at the beginning of the program. Despite the dismal day, people turned out in droves for the event. Looking at the long, long line of adults, children, strollers and dogs on leashes that snaked ahead and behind me as we walked our 5-K show of support, I felt hope. The number of walkers has swollen over the years I've been attending this event. The rain stopped and the clouds lifted a little. I began to believe that Montanans - and humans in general - will find a way to conquer mental illness. The suicide rate in Montana is alarming. But today, I was proud of the attempts Montanans are making to lower that statistic. My husband and I - in our bright orange Montana 2014 NAMIWalk shirts. To read more about Montana 2014 NAMIWalk, click here, and to learn more about NAMI click here. Is there a NAMI State Organization or Affiliate where you live? Like most people - there is no way I could choose my top five favorite photos! I narrowed it down a bit by selecting ones I like best just from all the photos published on this blog thus far. Even that was daunting. 1. This photo is of my husband, kids, and me several years ago - during a very fun vacation in Arizona that involved a lot of horseback riding. This photo reminds me of wonderful memories - and a lot of love. It was published on the “About Me” page of my blog. 2. These bull elk sometimes hang out on our property, and I took this photo from my front door. Elk visitors and sunny blue skies are a few of the reasons why (despite snow and frigid temperatures) I love living in Montana, and blog about it as much as I do! Don't you just love the snowy muzzle of the guy on the right? 4. I was really happy with how this dessert recipe turned out - and with the quality of the picture I was able to take of it for this blog. Even the moon cooperated - it was huge, full and in just the right place for this photo! 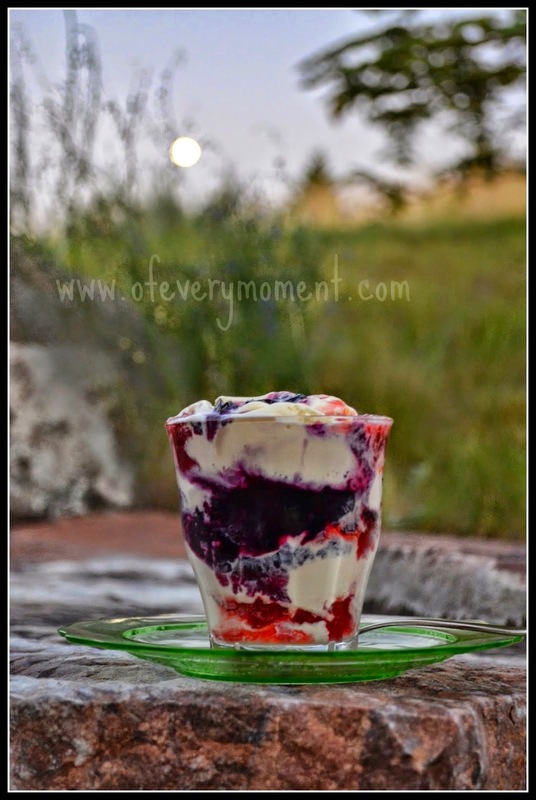 This photo now reminds me of a warm Montana evening - and a delicious dessert! #5. Watching fireworks set off by near-by communities and our neighbors during the evening of July 4, I attempted to take some photos. They turned out better than I ever expected - especially this one. 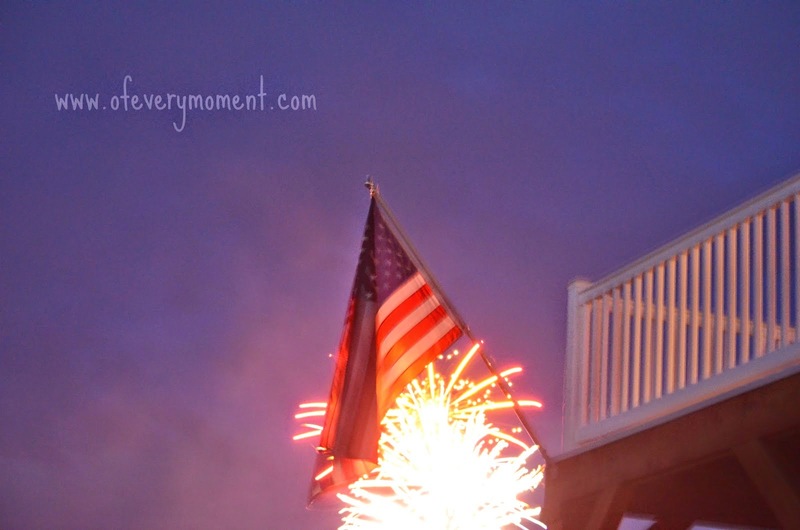 I really wanted a photo of the fireworks exploding behind our flag. Waiting patiently on our lawn, I was rewarded when my neighbors finally set one off that burst just in the right spot. This past Thursday, I posted a photo and said it was one of my favorites. Since I published it so recently, and I have already mentioned five others, I won't include it here! 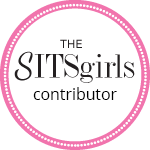 Be sure to visit the Lifestyle Sistas Linkup by clicking on the link at the top of this post, and see all the favorite photos posted there. Then, consider adding a link of your own! Which of these photos do you like the best? When my son and our dog were both a lot younger, they liked to sleep in the same room. After I made window valances for my son's bedroom, I had quite a bit of unused fabric. When our dog needed a new bed, I decided to make one for her with the left-over valance material. Our dog seemed to like her new bed, and slept on it regularly. One night though, when I peeked in to check on my son, I had quite a surprise. The lights were still on, and the room was in an all-too-common state of disarray. Both occupants were sound asleep. What was really odd, however, was where they were sleeping! The dog was flaked out comfortably across the bed. My son was curled up in a ball, on top of the dog's bed. Somehow, the dog had been convinced that my son should at least be able to use his own pillow, as it was under the head of the boy - not the dog. I still laugh out-loud when I think about this. Surely he knew the dog would always play “paper”! A fiction post here today - very loosely based on a memory! One of last week's Words for Wednesday word prompts reminded me of a long ago evening. I had gone out to dinner and then to a formal dance, with some nursing friends and our dates. Escargot (the word that triggered this memory) was our dinner appetizer, and we probably did tell a few stories of our nursing experiences. Everything else about the following story is completely fictional, however, and fabricated to make use of all 12 words provided as the writing prompt! I enjoy escargot, but I have never prepared it. Click on the escargot link in the following story, for a recipe! At a French restaurant, wearing an extremely large corsage, many years ago! The last escargot dangled enticingly from Sheila's small fork. Robert eyed it longingly - wishing his serving had been larger. He was looking forward to the rest of the meal at this fancy French restaurant. It would almost make wearing this suit worthwhile - though he far preferred the comfort of denim. Robert and Sheila were just friends, but she had recently broken up with her boyfriend, so had asked him to accompany her this evening. The event was a formal dance organized by and for the student nurses, and they had decided to go out to dinner first with several other couples. He had thought it sounded fun. Interesting may have been a better adjective. Sheila and her two classmates had entertained their dates all evening, with tales of their hospital experiences. The women were careful to protect the identity of patients, and at intervals the mood of the conversation had shifted from humor to empathy. Just then, Jan, the young woman sitting across the table from him, began to convulse with laughter. Robert practically fell off his chair, he was suddenly laughing so hard. Jan had been completely unaware of the double entendre of her words. Or, at least he thought so! The waiter cleared the plates and brought the next course. This all-inclusive five course menu had turned out to be a pretty good deal, although it had seemed costly at first. Robert noted the dandruff on the shoulders of the waiter's coat, and pitied the poor guy for the unfortunate dark color of his uniform. Sheila's other friend, Andrea, began to give a detailed description of how a patients condition had begun to degenerate during her shift. Losing interest, he turned to Jan's date, Mike, who had been a friend of his for years. He and Mike were soon talking about the work Mike had been doing to retrofit his car. For fun - I decided to use all 12 words. Have you ever eaten or cooked escargot? Do you have any strong memories of an occasion associated with a particular food? When children participate in a sport, there are a lot of things their parents must know, as well. My son has played soccer for 13 years. I have learned there are some things I should always bring with me, when I go to his games. Soccer is played in all kinds of weather. The soccer weather I have experienced has been stifling hot; bitter cold; extremely gusty; pouring rain, sleet or snow; and even, on some occasions, absolutely perfect. It has been so muddy my shoes have squelched with every step. Prior to a MT State high school championship game in recent history, a snowplow was required to clear heavy snowfall from the pitch before the game. It is always best to prepare for anything and everything! Forget fashion! Sometimes you just have to bundle up! Soccer games are long - sometimes lasting over two hours, depending on age group and ability level. Personally I'm unable to sit during an exciting game, but many people prefer not to stand for that length of time. If you don't know all the kids on the team, or if many are of similar build and haircut/color, a list of their names and jersey numbers is a helpful reference. Sometimes as you are squinting into sun or driving rain, the only way to recognize even your own child is by his/her number. A game is a lot more exciting to watch if you know who is doing what! 4). A camera with a zoom lens - or a friend who has one! A photo documentary of this important part of your child's life is nice to have. Pictures taken from the sidelines are much better if a zoom lens is used. You may end up with some incredible action shots, well-worthy of being framed. A parent's role is to be supportive and positive. Clap and cheer, and afterwards (victory or defeat), tell your child that you are proud of them. Leave the coaching to the coaches; the refereeing to the referees, and keep any negative thoughts to yourself. Enough said! Players need to remember to bring other items such as uniforms and snacks, of course; but following these five suggestions can make spectating a soccer game much more pleasant. Snow had to be plowed off the soccer pitch before games could be played, the weekend this photo was taken. Can you think of anything I forgot? A version of this post was previously published by Yahoo Contributor Network, and was mentioned on this blog on April 12, 2014. Since it is no longer available on Yahoo Voices, I have provided the information again here. This past weekend in Montana, the weather could not have been better. It was truly a couple of “Indian summer” days. Happily, it sounds like we may be having this summer-like weather for a while! Saturday, we traveled the same distance (130 miles each way) that we had on Thursday, for another of my son’s high school soccer games. Fall colors were at their peak, and the sky was blue - so the miles flew by! Sunday, I volunteered at a school fundraiser - and enjoyed soaking up the sun during this outdoor event. I haven’t mentioned this before, but my husband and I belong to a “wine group.” A while back, friends of ours purchased “The Everyday Guide to Wine” video lecture series by Jennifer Simonetti-Bryan, offered by The Great Courses. They invited us and another couple to join them in this effort to learn more about wine. The six of us get together every few months to watch a chapter of the video, and sample the wines of the region being discussed. We take turns hosting, and the host-couple provides a meal. Although I still am a long way from becoming a knowledgeable wine connoisseur, we have had a lot of fun. This weekend it was time to study California wines, and it had been decided that hearty appetizers would go well with these. Typically the host provides all of the food, but this time we broke tradition, and decided it would be fun if we all contributed to the buffet. Indian Six-layer Dip, Roasted Garlic and Rosemary Pumpkin Hummus, & Mushroom Pate were only a few of the delectable dishes on this buffet. We arrived at our friend’s beautiful Arts and Crafts designed home, and realized we were in for a magical evening. They had set a table and buffet in one of their lovely gardens, overlooking their beautiful rural property. The evening was warm enough for summer clothing, with a need for just a sweater when the sun set. What could be better than amazing food, interesting wines, great friends, and even some entertainment by the horses in the pasture across from our table. The horse and mule frolicked - chasing each other, jumping a small hill, bucking with joy, and rolling in the dirt. We stayed long after the sun went down, and it was just a perfect evening. Roasted Garlic and Rosemary Pumpkin Hummus from Pinch of Yum. Our host made an Indian Six-Layer Dip, and I just had to have the recipe. To my surprise, he told me he got it from a cookbook I already own, Perfect ONE-DISH Dinners by Pam Anderson. The recipe is on page 248. Google Books actually includes this recipe in their preview of this cookbook, so you can find it here. I would really recommend purchasing the cookbook though - as it contains many wonderful recipes! Our friends graciously agreed that I could include a few photos of them in this blog post. Here is a glimpse of the fun we had. We sipped wine in our friends enchanted garden, while we listened to the video lecture on California wines. A perfect evening with great friends, delicious food, interesting wine and some friendly horses. Before dinner, I just had to pick a few carrots from the garden, to give the horse and mule a treat! Top Right: A colorful plate! Bottom Right: Homemade vanilla ice cream with fresh raspberries and homemade chocolate fudge sauce. This is not the last post I will write about our Wine Group adventures. Last spring my husband and I hosted a Spanish-themed dinner, when it was time to study Spanish wines. I am planning a series of posts with tutorials of how to prepare some of the recipes we made. Look for them this fall. Have you ever belonged to a dinner or wine group that meets regularly? I highly recommend it! All of the opinions expressed here are entirely my own and I received no compensation for any of the content provided in this post. Lana published a fun and informative post yesterday about some exciting spots she would like to visit. Click here to read her post and others on this topic, and learn more about the link-up. So - Which five places would I want to go? Hmmmm. 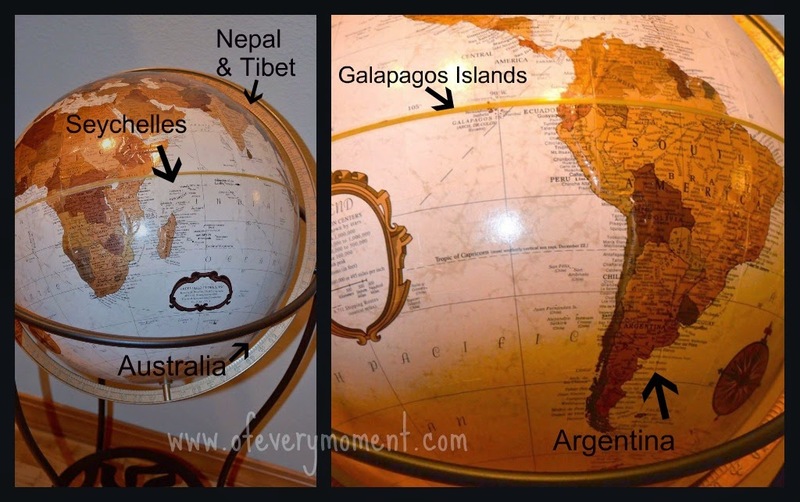 I have traveled a lot of the globe, but there are so many places I would still like to see - or return to for another visit. My list can grow quite long, but here is what first came to my mind, as I thought about this today. I remember studying Argentina in ninth grade and thinking it was a place I would really enjoy. I have not yet been there - but I still hope to. It seems like it might have a lot of similarities to Montana - perhaps that is why I think I would like it so much! Oh - how I would love to see all the animal species that live on these volcanic islands! I have no interest in climbing to the summit of Everest, but I would enjoy the scenery, meeting the people, and learning more about the culture of this region. These beautiful islands in the Indian Ocean are my idea of paradise. Beautiful beaches, warm waters to swim in, giant tortoises and inland jungle. I have never been to this chain of islands, but I am pretty sure it is a place where I could really relax! But Lana mentioned Bora Bora - I could just as easily be happy there! There are beautiful beaches all over the world. This is one I visited in Jamaica. How about you? What 5 places are on your bucket list? If you are a blogger, write a post about your choices, and link it up at Lana's blog today! I had a post planned for today, but it did not get written. Instead, I had an impromptu date with my husband last night! We drove 130 miles yesterday afternoon to watch my son's high school soccer game. Before heading home after the match, my husband and I decided to go out for dinner. The soccer teams traveled by bus, so my son actually got home before we did. An action setting on a camera is a wonderful feature when photographing sporting events! 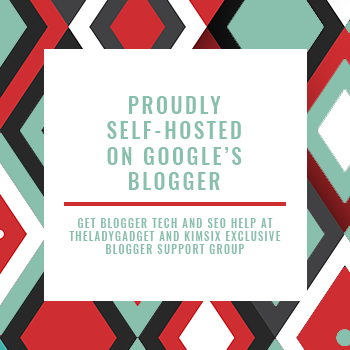 I have read that bloggers sometimes need to step away from blogging, and live life, so they have something to blog about! I agree. Yesterday was a good day of “living life.” I spent a warm and sunny afternoon watching an exciting soccer game. (Our team won, so my son and his friends were happy.) My husband and I spent some quality time together, and we enjoyed a delicious meal. In fact, the food was so good that perhaps I will even write about the restaurant in a future blog post! My husband and I, after a wonderful meal of international flavors! The post I had planned to write for today will just have to wait - until this afternoon, or even next week. If ever you visit this blog, and I haven't published new content as consistently as I usually do - rest assured that I haven't stopped writing. I am just out living life - and coming up with more topics to write about. Montana is a big state! How far do you usually travel to attend your kid's sporting events?